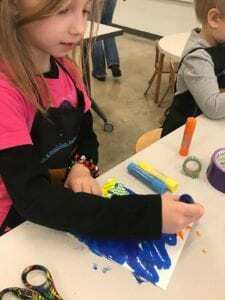 Youth can join their friends and go on an adventure into art during a homeschool program being offered beginning in early September by the Johnson County Park & Recreation District. Homeschool Art is the name of this program, which is for ages five to 15, and is designed to supplement homeschool curriculum. Participants will have collaborative experiences meant to encourage them to explore art through consideration, conversation, and creation. Two different themes for Homeschool Art programs with sessions starting in early September are being offered: Art Adventures, for ages five to 15, and Advanced Art Adventures for ages 11 and older. All of these programs take place at the Johnson County Arts & Heritage Center, 8788 Metcalf Ave., Overland Park. These classes involve 11 two-hour sessions at a cost of $95 per person for Johnson County residents or $99 per person for nonresident Two different sessions of Art Adventures and Advanced Art Adventures are offered beginning in early September. One session of Art Adventures meets at 10 a.m. Wednesdays beginning Sept. 5 (course ID 11813), while the other meets at 10 a.m. Thursdays beginning Sept. 6 (course ID 11816). One session of Advanced Art Adventures meets at 1 p.m. Wednesdays beginning Sept. 5 (course ID 11818), while the other meets at 1 p.m. Thursdays beginning Sept. 6 (course ID 11820). For more information or to register, call (913) 831-3359. To register online at www.jcprd.com, click on “Register for Activities,” and complete a course ID search for the code numbers listed above. Additional Homeschool Art classes with the theme “Clay Creations,” will be offered for ages five to 15 beginning Nov. 28 (course ID 11821) and Nov. 29 (course ID 11822).